A chic wreath made up of antique gold magnolia leaves and purple berries brings a posh vibe to an otherwise traditional foliage. How about this… online shopping for dessert! Pumpkin cheesecake made to order! Every table needs a serving platter… why not make it the most beautiful empty platter on the table! I love the idea of dressing up a candle to add some WOW! factor to ambient lighting. 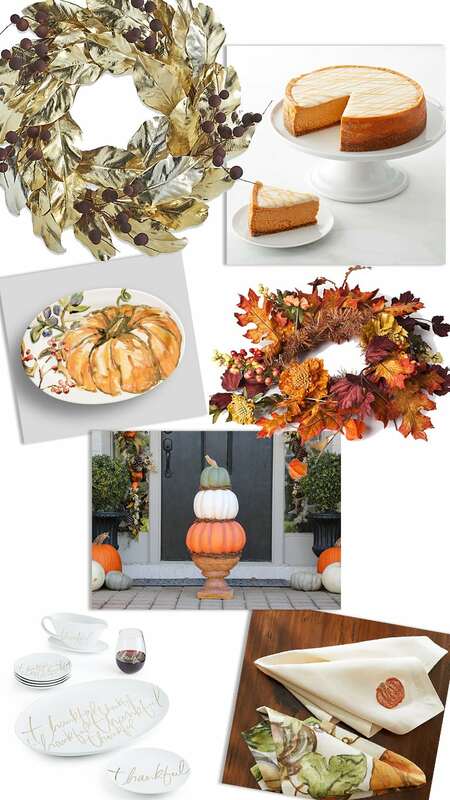 And what better way to spice up the table than with some Fall foliage. Greet your guests with a porch adorned with heirloom pumpkins! These gorgeous plates scripted with the sentiment of the season are the way to go for a more minimalist look. Printed linens are a great way to add some fun and texture to a table setting.